The emergence of multi-drug resistant tuberculosis (MDR-TB) has heightened the need for new chemical classes and innovative strategies to tackle TB infections. It is urgent to discover new classes of molecules without cross-resistance with currently used antimycobacterial drugs. Eighteen new 8-substituted protoberberine derivatives were synthesized and evaluated for their anti-mycobacterial activities against Mycobacterium tuberculosis (M. tuberculosis) strain H37Rv. Among them, compound 7g was the most effective antitubercular agent with minimum inhibitory concentration (MIC) of 0.5 μg/mL. Moreover, it also afforded a potent antitubercular effect against clinically isolated MDR strains of M. tuberculosis with MICs ranging from 0.25 to 1.0 μg/mL, suggesting a novel mode of action. The structure−activity relationship (SAR) analysis revealed that introduction of a substituent at the 8-position in pseudoprotoberberine, especially an n-decyl, could significantly enhance the anti-TB activity. We consider 8-n-decylberberines to be a novel family of anti-tubercular agents with an advantage of inhibiting MDR strains of M. tuberculosis. Currently, one third of the world’s population is infected with Mycobacterium tuberculosis (M. tuberculosis) . It is anticipated that there will be about 8.9−9.9 million new and relapse tuberculosis (TB) cases this year, more than in any other year in history [2, 3]. The limited effectiveness and long-term treatment lead to poor patient compliance, which often causes multi-drug resistant (MDR) and extensively-drug-resistant (XDR). The emergence of new cases, the increased incidence of MDR strains of M. tuberculosis, the adverse effects of first-line anti-TB drugs isoniazid (INH) and rifampin (RIF) [4, 5], and the increased incidence of TB associated with HIV infections [6–8] have led to renewed research interest in discovering novel anti-TB drugs. Especially, the emergence of MDR-TB and of the virtually untreatable MDR-TB has heightened the need for new chemical class and innovative strategies to tackle TB infections. However, truly novel antitubercular drugs other than repurposed drugs have not been developed since the 1970s [9, 10]. Though new anti-TB drug Bedaquiline was just approved by FDA last year , there is still an urgent need to discover new classes of molecules without cross-resistance with currently used antimycobacterial drugs. We have identified 13-substituted protoberberine derivatives to be a novel family of anti-TB agents  with poor solubility. The primary structure−activity relationship (SAR) indicated that the berberine ring (BBR, 1, Figure 1) might be beneficial for keeping good antitubercular activity. 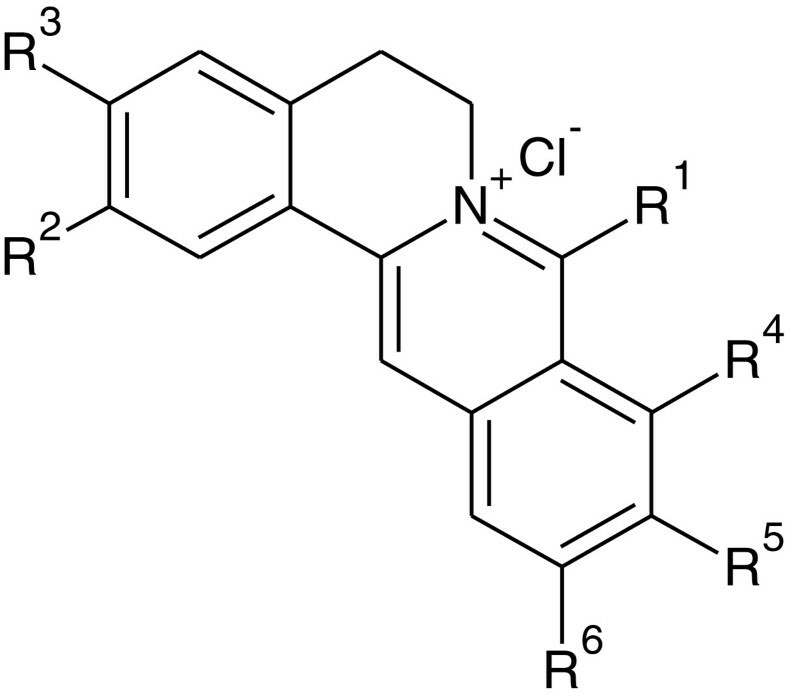 In our ongoing efforts to discovering new anti-TB agents, we turned our SAR analysis on the substituents at the 8-position of BBR derivatives, by which nitrogen ion at the 7-position might be blocked by the 8-substituents with bigger volume, thereby enhancing the solubility of this kind of compounds. Based on this strategy, several 8-substituted protoberberine derivatives (6a–e) were designed, semi-synthesized and evaluated for their antimycobacterial activity against M. tuberculosis strain H37Rv. Furthermore, by replacing 1 with pseudoberberine (2, Figure 1) or palmatine (3, Figure 1) core, two natural products extracted from Chinese herb Huanglian, by which a group of new 8-substituted pseudoberberine (7a–h) or palmatine (8a–e) derivatives was generated for testing. Herein, eighteen 8-substituted protoberberine derivatives (Figure 2) were designed and synthesized, and their anti-mycobacterial effects were evaluated afterwards. Chemical structures of compounds 1, 2 and 3. General structural formula of 8-substituted BBR derivatives. Eighteen target compounds were synthesized with commercially available 1, 3 or 2 (synthesized in our laboratory) [13, 14] as the starting material as described in Scheme 1. The Grignard reagents were first prepared with Mg turnings and the corresponding alkyl and aryl iodide in absolute ether under N2 protection. The key intermediates dihydroberberine, dihydropseudoberberine or dihydropalmatine (4) were obtained via nucleophilic substitution of newly synthesized Grignard reagents with 1, 2 or 3 under N2 protection, respectively [15, 16]. Then, the intermediate 4 was oxidized using bromine as a oxidizing agent in HOAc at refluxing temperature to yield the 8-substituted berberine bromate 5, which was converted into the corresponding chloride 6–8 with AgCl in MeOH at room temperature. Finally, the desired products in series 6, 7 and 8 were purified by flash column chromatography using methanol/dichloromethane as the gradient eluent with overall yields of 72%–81%. The synthetic route of the target compounds. Our SAR strategy was first focused on the modifications of the substituents at the 8-position in BBR. According to our previous SAR results, several lipophilic groups including p-methoxyphenyl (6a), m-methoxyphenyl (6b), p-methylphenyl (6c), 1-naphthyl (6d) and n-decyl (6e) were introduced into the 8-position aiming to improve the cLogP value (Table 1), thereby enhancing the anti-mycobacterial activity. Among these analogues, compound 6e possessing an n-decyl afforded the hightest antibacterial activity with a MIC of 2.0 μg/mL against M. tuberculosis. The results supported that the increased cLogP value might be helpful for enhancing the anti-TB activity of this kind of compounds. a: General structural formular is shown in Figure 2.
b: MIC: minimum inhibitory concentration. c: Chemoffice Ultra 11.0 (Cambridge office). In order to further explore the influence of the BBR core, a variety of lipophilic substituents were attached to the 8-position of 2, by which the 8 new 8-substituted pseudoberberine classes (7a−h) were generated for testing. The results showed (Table 1) that the majority of them (7b−h) exhibited potential anti-mycobacterial activities with MICs ranging from 0.5 μg/mL to 2.0 μg/mL. It seems that the 10,11-dimethoxy on the ring D would be beneficial for their binding affinity to the target molecular. Compound 7g bearing an n-decyl afforded the best anti-TB activity with a MIC of 0.5 μg/mL. Similarly, the lipophilic side-chains were also introduced to the same position in 3, and then 5 new 8-substituted palmatine analogues (8a−e) were made. As expected, compound 8e with an n-decyl at position 8 had the most potent activity with an MIC of 1.0 μg/mL. It was deduced that an n-decyl at the 8-position would improve the anti-mycobacterial activity as regarding to this kind of compounds. 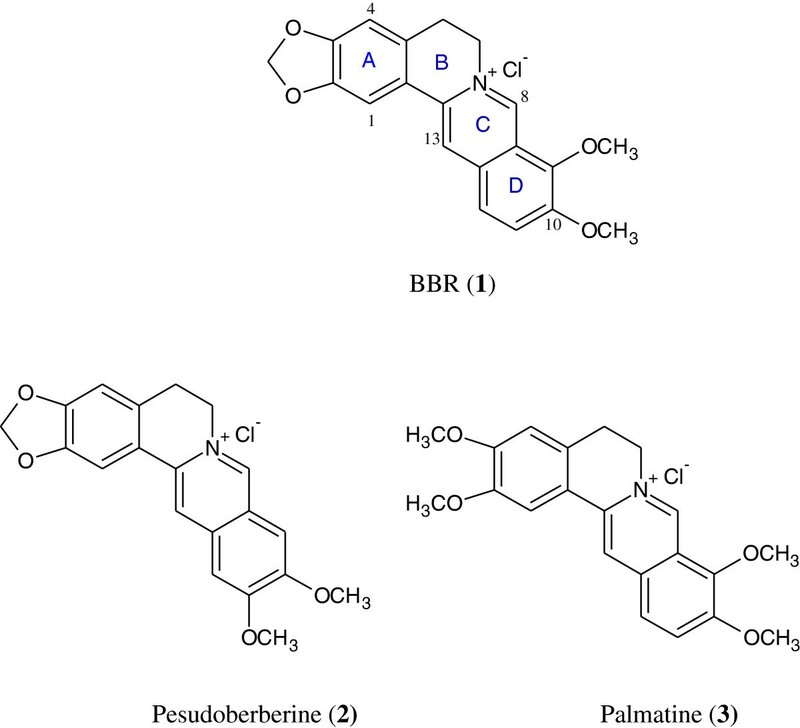 The pesudoberberine ring might be beneficial for the antimycobacterial activity, and thus the representative compounds in 7 series were chosen for further investigation. As compound 7g bearing an n -alkyl at position 8 possessed an excellent activity against drug-susceptible M. tuberculosis strain H37Rv, it was selected to test the anti-TB activity against MDR strains. In this experiment, M. tuberculosis strains 87, 192, 262 and 266 isolated from the patient infected with tuberculosis in China, were resistant to both RIF and INH. RIF and INH showed a decreased activity against the drug-resistant stains partially or completely with MIC ranges between 2 and > 32 μg/mL (Table 2), while compound 7g afforded a potential effect against MDR strains with comparable MIC ranges of 0.25−1 μg/mL. In addition, compound 7f possessing an aromatic moiety at the 8-position in 7 series afforded a moderate cLogP value (cLogP = 1.60) and then was chosen to evaluate for the drug-resistant strains as well. As described in Table 2, 7f showed an equivalent potency against the drug-susceptible strain H37Rv and multidrug-resistance isolates of M. tuberculosis strains 257, 373, 559 and 164 with a MIC range between 2 and 4 μg/mL as well. The results indicated that 7g and 7f were effective for drug-susceptible M. tuberculosis as well as MDR strains isolated from TB patients in China, suggesting a mode of action different from currently used anti-TB drugs. a: MDR strains were isolated from patients with tuberculosis in China. b: MIC values against MDR strains 257, 373, 559 and 164.
c: MIC values against MDR strains 87, 192, 262 and 266. Both of compounds 7g and 7f were further tested their cytotoxicity in African green monkey kidney (Vero) and human lung fibroblast (MRC-5) cells with MTT assay. Cytotoxicity activity was expressed with CC50 value, and the selectivity index (SI), as an important therapeutic indication, was calculated as the ratio of CC50 to MIC value. Anti-TB effect of compounds 7g and 7f was evaluated by combining their MIC with SI values. As described in Table 3, compound 7g showed a moderate SI value of 10.3 and 17.6 in Vero and MRC-5 cells, respectively. a: Cytotoxic concentration required to inhibit Vero or MRC-5 cell growth by 50%. b: Selectivity index (SI) value equaled to CC50/MIC. Melting point (m.p.) was uncorrected and recorded on a Mettler Toledo MP90 melting point apparatus. 1H NMR and 13C NMR spectra were recorded on Varian 400 MHz spectrometer. Chemical shift was reported relative to internal tetramethylsilane (δ 0.00 ppm) or (CD3)2SO (δ 2.50 ppm) for 1H and (CD3)2SO (δ 39.5 ppm) for 13C. ESI high-resolution mass spectra (HRMS) were recorded on an Autospec UItima-TOF mass spectrometer (Micromass UK Ltd, Manchester, UK). Flash chromatography was performed on CombiflashRf 200 (Teledyne, Nebraska, USA), particle size 0.038 mm. Grignard reagents were prepared via Magnesium turnings (3.8 g) with the corresponding alkyl and aryl iodides (0.13 mol) in absolute ether (100 mL) at 0°C. The synthesized Grignard reagents were added to the suspension of dry 1, 2 or 3 (0.03 mol) in absolute ether (100 mL) dropwise under N2 protection at 0°C [15, 16]. After refluxing for 2 h, saturated NH4Cl solution (200 mL) was added to quench the reaction. The aqueous phase was extracted with ethyl acetate (3 × 100 mL) and the combined organic layers were washed with saturated brine (100 mL) and dried (Na2SO4). The mixture was concentrated in vacuo to give 4. Then, bromine solution (1N/ HOAc, 30 mL) was added to oxidize compound 4 in HOAc at refluxing temperature to generate the 8-substituted BBR derivatives bromate 5, which was treated with excessive AgCl in MeOH at room temperature thus converted into the corresponding chloride form. Finally, the desired products in series 6, 7 and 8 were purified by flash column chromatography using methanol/ dichloromethane as the gradient eluent with overall yields of 72%–81%. Yield: 78%; Brown solid; mp 220–221°C; 1H NMR: δ 9.04 (s, 1H), 8.23 (d, J = 9.2 Hz, 1H), 8.11 (d, J = 9.2 Hz, 1H), 7.84 (s,1H), 7.56 (d, J = 8.8 Hz, 2H), 7.22 (d, J = 8.8 Hz, 2H), 7.04 (s,1H), 6.18 (s,2H), 4.26 (t, J = 6.8 Hz, 2H), 4.00 (s, 3H), 3.98 (s, 3H), 3.20 (s, 3H), 3.01(t, J = 6.8 Hz, 2H); 13C NMR: δ 172.40, 160.65, 156.96, 153.08, 150.26, 148.18, 145.55, 138.47, 133.66, 131.30, 129.73, 126.90, 126.30, 124.72, 122.84, 121.88, 121.81, 114.41, 110.01, 108.36, 106.31, 102.56, 61.09, 57.44, 55.90, 52.26, 26.67; HRMS-ESI: m/z calcd 442.16490 C27H24NO5Cl [M − Cl]+, found 442.16476. Yield: 79%; Orange solid; mp 206–207°C; 1H NMR: δ 9.07 (s, 1H), 8.24 (d, J = 9.2 Hz, 1H), 8.11 (d, J = 9.2 Hz, 1H), 7.85 (s, 1H), 7.58 (t, J = 8.0 Hz, 1H), 7.20-7.26 (m, 3H), 7.04 (s, 1H), 6.18 (s, 2H), 4.27 (t, J = 6.4 Hz, 2H), 4.00 (s, 3H), 3.81 (s, 3H), 3.26 (s, 3H), 3.02 (t, J = 6.4 Hz, 2H); 13C NMR: δ 172.49, 159.61, 156.25, 153.02, 150.31, 148.20, 145.40, 138.37, 136.15, 133.72, 131.28, 130.41, 126.41, 124.65, 122.44, 121.76, 120.09, 115.85, 113.70, 108.39, 106.29, 102.58, 61.15, 57.45, 55.87, 52.35, 26.66; HRMS-ESI: m/z calcd 442.16490 C27H24NO5Cl [M − Cl]+, found 442.16466. Yield: 76%; Orange solid; mp 158–160°C (decomp); 1H NMR: δ 9.05 (s, 1H), 8.23 (d, J = 9.2 Hz, 1H), 8.12 (d, J = 9.2 Hz, 1H), 7.85 (s, 1H), 7.52 (d, J = 8.4 Hz, 2H), 7.47 (d, J = 8.4 Hz, 2H) ,7.03 (s, 1H), 6.18 (s, 2H), 4.23 (t, J = 6.4 Hz, 2H), 3.99 (s, 3H), 3.17 (s, 3H), 3.01 (t, J = 6.4 Hz, 2H), 2.47 (s, 3H); 13C NMR: δ 172.47, 156.95, 153.04, 150.28, 148.19, 145.48, 139.84, 138.45, 133.68, 132.14, 131.27, 129.59, 129.50, 128.03, 127.94, 126.38, 124.68, 122.63, 121.83, 108.37, 106.30, 102.57, 61.04, 57.46, 52.32, 26.63, 21.60; HRMS-ESI: m/z calcd 426.16998 C27H24NO4Cl [M − Cl]+, found 462.16986. Yield: 72%; Brown solid; mp 175–176°C; 1H NMR: δ 8.82 (s, 1H), 8.15−8.32 (m, 3H), 7.95−8.07 (m, 1H), 7.64−8.00 (m, 5H), 7.45−7.55 (m, 1H), 7.03 (s, 1H), 6.21 (s, 2H), 4.11−4.30 (m, 2H), 4.10 (s, 3H), 3.98 (s, 3H), 2.90−3.05 (m, 2H); 13C NMR: δ 172.49, 156.87, 152.61, 150.73, 148.43, 145.38, 139.24, 136.72, 132.16, 131.87, 130.76, 130.08, 129.20, 128.26, 127.56, 126.01, 125.12, 124.39, 123.76, 121.65, 120.95, 108.39, 106.68, 106.29, 106.09, 102.69, 60.99, 57.91, 52.56, 26.81; HRMS-ESI: m/z calcd 462.16998 C30H24NO4Cl [M − Cl]+, found 462.16996. Yield: 80%; Brown solid; mp 185–186°C; 1H NMR: δ 8.81 (s, 1H), 8.20 (d, J = 9.2 Hz, 1H), 8.02 (d, J = 9.2 Hz, 1H), 7.74 (s, 1H), 7.12 (s, 1H), 6.17 (s, 2H), 4.80 (t, J = 6.4 Hz, 2H), 4.03 (s, 3H), 4.05 (s, 3H), 3.16 (t, J = 6.4 Hz, 2H), 1.78 (t, J = 6.4 Hz, 2H), 1.27−1.58 (m, 16H), 0.87 (t, J = 6.4 Hz, 3H); 13C NMR: δ 172.49, 161.58, 152.99, 150.09, 148.11, 146.08, 138.29, 133.10, 131.28, 125.66, 125.20, 121.92, 120.71, 108.19, 106.26, 102.48, 62.05, 57.52, 50.10, 32.77, 31.78, 29.83, 29.46, 29.22, 29.19, 28.40, 27.13, 22.58, 21.54, 14.45; HRMS-ESI: m/z calcd 476.27954 C30H38NO4Cl [M − Cl]+, found 476.27971. Yield: 79%; Bright orange solid; mp 197–198°C; 1H NMR: δ 8.87 (s, 1H), 7.79 (s, 1H), 7.68 (s, 1H), 7.66 (d, J = 8.4 Hz, 2H), 7.33 (d, J = 8.4 Hz, 2H), 7.07 (s, 1H), 6.70 (s,1H), 6.19 (s, 2H), 4.34 (t, J = 6.4 Hz, 2H), 4.09 (s, 3H), 3.92 (s, 3H), 3.71 (s, 3H), 3.04 (t, J = 6.4 Hz, 2H); 13C NMR: δ 161.47, 157.40, 155.03, 152.41, 150.32, 148.17, 139.55, 136.77, 131.66, 131.56, 131.39, 123.39, 122.89, 121.94, 119.24, 116.98, 115.36, 108.50, 106.94, 106.22, 106.13, 102.55, 57.23, 56.27, 55.99, 52.12, 26.82; HRMS-ESI: m/z calcd 442.16490 C27H24NO5Cl [M − Cl]+, found 442.16488. Yield: 77%; Yellow solid; mp 224–225°C; 1H NMR: δ 8.90 (s, 1H), 7.80 (s, 1H), 7.67−7.71 (m, 2H), 7.30−7.35 (m, 2H), 7.26 (d, J = 6.4 Hz, 1H), 7.08 (s, 1H), 6.66 (s, 1H), 6.19 (s, 2H), 4.33 (t, J = 6.4 Hz, 2H), 4.09 (s, 3H), 3.85 (s, 3H), 3.70 (s, 3H), 3.06 (t, J = 6.4 Hz, 2H); 13C NMR: δ 160.14, 157.53, 154.44, 152.48, 150.37, 148.20, 139.48, 136.92, 132.26, 131.74, 131.34, 122.93, 121.79, 121.62, 119.33, 117.31, 115.15, 108.54, 106.72, 106.20, 106.08, 102.57, 57.25, 56.27, 55.99, 52.27, 26.78; HRMS-ESI: m/z calcd 442.16490 C27H24NO5Cl [M − Cl]+, found 442.16475. Yield: 78%; Yellow solid; mp 212–213°C; 1H NMR: δ 8.89 (s, 1H), 7.80 (s, 1H), 7.69 (s, 1H), 7.61 (d, J = 8.4 Hz, 2H), 7.58 (d, J = 8.4 Hz, 2H), 7.07 (s, 1H), 6.65 (s, 1H), 6.19 (s, 2H), 4.31 (t, J = 6.4 Hz, 2H), 4.09 (s, 3H), 3.69 (s, 3H), 3.05 (t, J = 6.4 Hz, 2H), 2.54 (s, 3H); 13C NMR: δ 157.44, 155.01, 152.43, 150.34, 146.65, 148.18, 141.42, 139.55, 136.85, 131.35, 130.50, 129.66, 128.20, 123.13, 121.87, 119.30, 108.51, 106.80, 106.21, 106.14, 102.56, 57.24, 56.25, 52.20, 26.78, 21.64, 21.52; HRMS-ESI: m/z calcd 426.16998 C27H24NO4Cl [M − Cl]+, found 426.16986. Yield: 75%; Bright orange solid; mp 183–184°C; 1H NMR: δ 8.91 (s, 1H), 7.94 (d, J = 8.0 Hz, 2H), 7.87 (d, J = 8.0 Hz, 2H), 7.75−7.80 (m, 1H) 7.69 (s, 1H), 7.08 (s,1H), 6.60 (s, 1H), 6.19 (s, 2H), 4.30 (t, J = 6.4 Hz, 2H), 4.09 (s, 3H), 3.72 (s, 3H), 3.06 (t, J = 6.4 Hz, 2H); 13C NMR: δ 157.55, 153.59, 152.59, 150.41, 148.22, 139.64, 136.97, 134.87, 132.64, 131.83, 130.97, 130.20, 129.89, 126.50, 123.05, 121.76, 119.55, 108.56, 106.50, 106.22, 105.06, 102.60, 57.28, 56.39, 52.38, 26.76; HRMS-ESI: m/z calcd 446.11536 C26H21NO4Cl2 [M − Cl]+, found 446.11483. Yield: 76%; Bright yellow solid; mp 179–180°C; 1H NMR: δ 8.93 (s, 1H), 7.79−7.90 (m, 5H), 7.71 (s, 1H), 7.08 (s, 1H), 6.57 (s, 1H), 6.20 (s, 2H), 4.32 (t, J = 6.4 Hz, 2H), 4.09 (s, 3H), 3.71 (s, 3H), 3.07 (t, J = 6.4 Hz, 2H); 13C NMR: δ 157.58, 152.94, 152.63, 150.44, 148.23, 139.58, 137.05, 134.69, 132.96, 131.98, 131.74, 131.35, 129.59, 128.64, 123.00, 121.69, 119.63, 108.57, 106.40, 106.23, 106.14, 102.61, 57.31, 56.36, 52.46, 26.76; HRMS-ESI: m/z calcd 446.11536 C26H21NO4Cl2 [M − Cl]+, found 446.11481. Yield: 72%; Yellow-brown solid; mp 198–200°C (decomp); 1H NMR: δ 9.14 (s, 1H), 8.38 (d, J = 7.8 Hz, 1H), 8.22 (d, J = 7.8 Hz, 1H), 7.84−7.92 (m, 4H), 7.67−7.71 (m, 1H), 7.51−7.55 (m, 1H), 7.40 (d, J = 8.2 Hz, 1H), 7.05 (s, 1H), 6.34 (s, 1H), 6.20 (s, 2H), 4.20−4.32 (m, 2H), 4.10 (s, 3H), 3.43 (s, 3H), 2.93−3.05 (m, 2H); 13C NMR: δ 157.14, 152.66, 152.16, 149.89, 147.72, 139.79, 136.83, 133.09, 131.62, 130.90, 130.17, 129.01, 128.92, 128.36, 127.50, 127.35, 125.86, 124.42, 123.19, 121.54, 119.55, 108.07, 105.90, 105.80, 105.65, 102.12, 56.85, 55.65, 51.55, 26.40; HRMS-ESI: m/z calcd 462.17053 C30H24NO4Cl [M − Cl]+, found 462.17072 (See Additional file 1). Yield: 78%; Yellow-brown solid; mp 173–174°C; 1H NMR: δ 8.67 (s, 1H), 7.68 (s, 2H), 7.11 (s, 1H), 6.37 (s, 1H), 6.17 (s, 2H), 4.77 (t, J = 6.4 Hz, 2H), 4.06 (s, 6H), 3.67 (t, J = 6.4 Hz, 2H,), 3.15 (t, J = 6.4 Hz, 2H), 1.24−1.16 (m, 16H), 0.85 (t, J = 4.0Hz, 3H); 13C NMR: δ 158.04, 157.19, 152.67, 150.12, 148.07, 139.33, 136.11, 131.31, 122.12, 122.02, 118.54, 108.31, 106.60, 106.21, 106.15, 102.49, 57.11, 56.94, 49.80, 31.77, 29.54, 29.45, 29.43, 29.26, 29.18 (2), 28.22, 27.17, 22.57, 14.44; HRMS-ESI: m/z calcd 476.28008 C30H38NO4Cl [M − Cl]+, found 476.27990 (See Additional file 1). Yield: 80%; Bright yellow solid; mp 161–163°C (decomp); 1H NMR: δ 8.65 (s, 1H), 7.66 (s, 1H), 7.59 (s, 1H), 7.09 (s, 1H), 6.36 (s, 1H), 6.16 (s, 2H), 4.75(t, J = 6.4 Hz, 2H), 4.05 (s, 6H), 3.65 (t, J = 6.4 Hz, 2H,), 3.14 (t, J = 6.4 Hz, 2H), 1.20−1.74 (m, 20H), 0.84 (t, J = 4.0Hz, 3H); 13C NMR: δ 158.12, 157.18, 152.67, 150.12, 148.07, 139.30, 136.09, 131.28, 122.09, 121.99, 118.50, 108.30, 106.57, 106.17, 106.12, 102.50, 57.10, 56.93, 49.79, 31.78, 29.53, 29.49, 29.42, 29.32, 29.25, 29.17, 29.14, 28.84, 28.21, 27.16, 22.58, 14.44; HRMS-ESI: m/z calcd 504.31084 C32H42NO4Cl [M − Cl]+, found 504.31047. Yield: 81%; Brown solid; mp 168–169°C; 1H NMR: δ 9.13 (s, 1H), 8.24 (d, J = 9.2 Hz, 1H), 8.14 (d, J = 9.2 Hz, 1H), 7.67 (s, 1H), 7.58 (d, J = 8.2 Hz, 2H), 7.23 (d, J =8.2 Hz, 2H), 7.04 (s, 1H), 4.29 (t, J = 6.4 Hz, 2H), 4.00 (s, 3H), 3.96 (s, 3H), 3.86 (s, 3H), 3.82 (s, 3H), 3.24 (s, 3H), 3.05 (t, J = 6.4 Hz, 2H); 13C NMR: δ 172.49, 160.74, 156.93, 152.77, 151.98, 149.36, 145.94, 139.98, 138.68, 133.77, 131.53, 129.72, 126.78, 124.63, 122.78, 121.49, 120.32, 113.38, 114.51, 111.29, 109.69, 61.32, 57.96, 56.81, 56.42, 55.87, 55.92, 26.37; HRMS-ESI: m/z calcd 458.19620 C28H28NO5Cl [M − Cl]+, found 458.19613. Yield: 78%; Red-brown solid; mp 170–171°C; 1H NMR: δ 9.15 (s, 1H), 8.25 (d, J = 9.2 Hz, 1H), 8.14 (d, J = 9.2 Hz, 1H), 7.76 (s, 1H), 7.56−7.60 (m, 1H), 7.20−7.26 (m, 3H), 7.05 (s, 1H), 4.29 (t, J = 6.4 Hz, 2H), 4.00 (s, 3H), 3.96 (s, 3H), 3.86 (s, 3H), 3.82 (s, 3H), 3.24 (s, 3H), 3.05 (t, J = 6.4 Hz, 2H); 13C NMR: δ 165.70, 159.62, 156.25, 152.87, 152.04, 149.24, 145.37, 138.59, 136.24, 133.82, 130.42, 129.30, 126.42, 124.54, 122.36, 121.52, 120.10, 115.78, 113.73, 111.21, 109.66, 61.13, 57.42, 56.73, 56.34, 55.87, 52.49, 26.35; HRMS-ESI: m/z calcd 458.19619 C28H28NO5Cl [M − Cl]+, found 458.19615. Yield: 74%; Yellow-brown solid; mp 164–165°C; 1H NMR: δ 9.15 (s, 1H), 8.24 (d, J = 9.2 Hz, 1H), 8.15 (d, J = 9.2 Hz, 1H), 7.76 (s, 1H), 7.46−7.52 (m, 4H), 7.04 (s, 1H), 4.25 (t, J = 6.4 Hz, 2H), 4.00 (s, 3H), 3.96 (s, 3H), 3.86 (s, 3H), 3.18 (s, 3H), 3.03 (t, J = 6.4 Hz, 2H), 2.48 (s, 3H); 13C NMR: δ 172.49, 156.94, 152.89, 152.01, 149.22, 145.44, 139.80, 138.66, 133.78, 132.22, 129.51, 129.29, 128.00, 127.93, 126.38, 124.57, 122.56, 121.47, 120.26, 111.19, 109.67, 61.02, 57.43, 56.74, 56.34, 52.45, 26.32, 21.59; HRMS-ESI: m/z calcd 442.20128 C28H28NO4Cl [M − Cl]+, found 442.20128. Yield: 78%; Yellow-brown solid; mp 177–178°C; 1H NMR: δ 9.34 (s, 1H), 8.20−8.25 (m, 3H), 8.18 (d, J = 8.4 Hz, 1H), 7.84 (s, 1H), 7.76−7.80 (m, 2H), 7.63−7.67 (m, 1H), 7.47−7.49 (m, 2H), 7.02 (s, 1H), 4.13−4.35 (m, 2H), 3.99 (s, 3H), 3.94 (s, 3H), 3.85 (s, 3H), 2.93−3.05 (m, 2H), 2.77 (s, 3H); 13C NMR: δ 172.49, 155.06, 152.70, 152.07, 149.25, 144.94, 139.44, 134.03, 133.13, 132.42, 130.87, 130.58, 129.29, 128.21, 127.47, 126.59, 126.44, 126.00, 125.06, 124.74, 123.15, 122.16, 120.41, 111.19, 109.68, 60.78, 57.35, 56.78, 56.35, 52.40, 26.59; HRMS-ESI: m/z calcd 478.20128 C31H28NO4Cl [M − Cl]+, found 478.20113. Yield: 75%; Brown solid; mp 172–173°C; 1H NMR: δ 8.90 (s, 1H), 8.20 (d, J = 9.2 Hz, 1H), 8.02 (d, J = 9.2 Hz, 1H), 7.65 (s, 1H), 7.13 (s, 1H), 4.83 (t, J = 6.4 Hz, 2H), 4.07 (s, 3H), 4.05 (s, 3H), 3.93 (s, 3H), 3.88 (s, 3H), 3.18 (t, J = 6.4 Hz, 2H), 1.79 (t, J = 6.4 Hz, 2H), 1.27−1.60 (m, 16H), 0.87 (t, J =6 .4Hz, 3H); 13C NMR: δ 176.25, 161.55, 152.84, 151.86, 149.18, 146.05, 138.49, 133.20, 129.31, 125.67, 125.08, 121.62, 120.35, 111.06, 109.62, 62.04, 57.50, 56.68, 56.36, 50.23, 32.77, 31.78, 29.84, 29.48, 29.46, 29.23, 29.19, 28.43, 26.84, 22.58, 14.45; HRMS-ESI: m/z calcd 492.31084 C31H42NO4Cl [M − Cl]+, found 492.31064. 18 newly synthesized analogues were evaluated for their activity against the multiplication of wild-type M. tuberculosis strain H37Rv and MRD strains by the microplate alamar blue assay (MABA) at various concentrations of 128.0, 64.0, 32.0, 16.0, 8.0, 4.0, 2.0, 1.0, 0.5, 0.25, 0.125, and 0.0625 μg/ml. RIF and INH were used as positive controls. Subsequent two-fold dilutions were performed in 100 μL of 7H9 media in the 48-well microplates. Then 100 μL of bacterial suspension was added to result in a final bacterial titer of 1 × 106 CFU/mL. Plates were incubated at 37°C. At optimal time, alamar blue solution was added to the entire plate. Results were recorded at 24 h post-reagent addition. Visual MIC value was defined as the lowest concentration of drug that prevented a color change. African green monkey kidney (Vero) cells (6 × 103 cells/well) and human lung fibroblast (MRC-5) cells (1.2 × 104 cells/well) were plated into a 96-well plates and incubated 37°C in 5% CO2. Sixteen hours later the cell cultures were treated with various concentrations of compounds 7f and 7g. Cytotoxicity was evaluated with the tetrazolium 3-(4,5-dimethylthiazol-2-yl)-2,5-diphenyltetrazolium bromide (MTT) assay at 48 h. The 50% cytotoxic concentration (CC50) was calculated with Reed & Muench methods. Each experiment was repeated three times. In conclusion, 18 new 8-substituted BBR derivatives were synthesized and evaluated for their antimycobacterial activities against M. tuberculosis H37Rv. SAR analysis revealed that (i) introduction of a n-decyl at the 8-position might significantly enhance the activity; (ii) 10,11-dimethoxy on the ring D might be beneficial for the antimycobacterial activity. Among the test compounds, compound 7g exhibited the strongest activity against both drug-susceptible strains and MDR isolates of M. tuberculosis, suggesting a novel mechanism of action. It has been selected as an ideal compound lead against TB for further SAR investigation. We consider 8-n-decylberberines to be a novel family of anti-tubercular agents with an advantage of inhibiting MDR strains of M. tuberculosis. Ying-Hong Li, Hai-Gen Fu contributed equally to this work. This work was supported by the National Natural Science Fundation for Young Scientists (81102312) and the “National Mega-project for Innovative Drugs” (2012ZX09301002−001−017). The current study is an outcome of the constructive discussion with DQS and YXW, who offered necessary guidance to YHL and HGF to carry out their synthesis and characterization experiments. FS and LMG performed the antimycobacterial activities against M. tuberculosis H37Rv tests, ST and CWB carried out the 1H NMR and 13C NMR spectral analyses and HRMS analysis, and YHL did the cytotoxicity experiment. All authors read and approved the final manuscript.